Your system goes through lots of files and application day to day basis. Windows takes lots of update from the Internet regularly. This makes system prone to malware, spams, and many unwanted things. Your regular surveillance required to keep your system run smoothly and in a good condition. You can do that with the help of third party tool like Iobit Advance Systemcare. Some inbuilt tools come with your system for this purpose but you require third party tool for some advanced features. Iobit Advance SystemCare is a free Windows optimization tool. 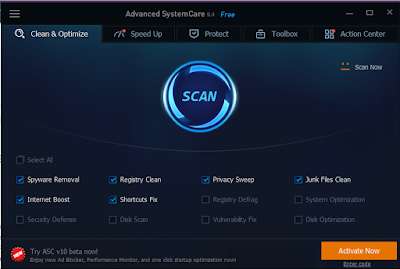 Iobit Advance Systemcare has many inbuilt applications that enhance your system performance, like registry cleaner, Spyware removal, junk files cleaner, privacy sweep, shortcut fixers, internet boosters, registry defragment, system optimizer, security defense, disc scan, vulnerability fixer, disk optimizer etc. 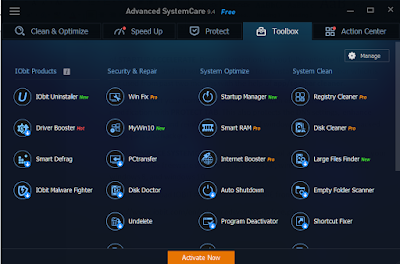 Iobit Advance SystemCare keeps your system in optimized condition with its automated options. You can optimize, repair and protect your system with the help of Iobit Advance Systemcare. 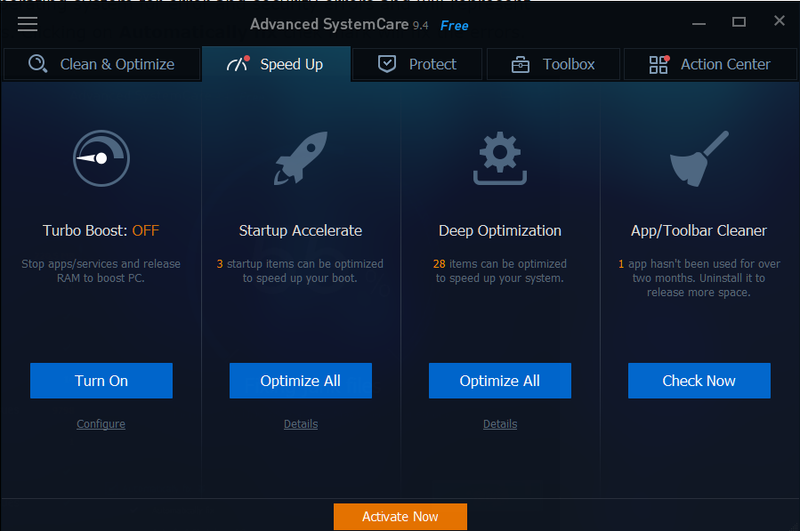 This software prevents your computer from slowing down. This application keeps your system error free with one click option. Click on Scan button to start cleaning and optimizing the system. This option will come under clean and optimize. You will get no of error list after this software scans your operating system for error and security errors. You can fix the error by clicking on “AUTOMATICALLY FIX” check mark. You can choose from auto fix and shutdown PC, auto fix and restart PC, auto fix and hibernate PC, auto fix and sleep PC apart from the “AUTOMATICALLY FIX” option. This program will fix the errors and process further with selected option. You can turn on turbo boost to stop apps /services and release RAM to boost your PC under speed up the tab. You can stop unnecessary startup programs with the help of STARTUP ACCELERATE. Deep optimization let you fully optimize the system, RAM, the Internet, and HD settings. It tells you to uninstall the app/toolbar which is not used from past two months with the help of app/toolbar cleaner. 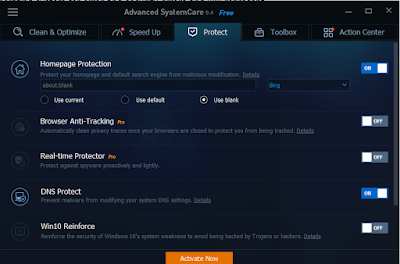 You can protect your homepage and default search engine from malicious modification with PROTECT TAB. 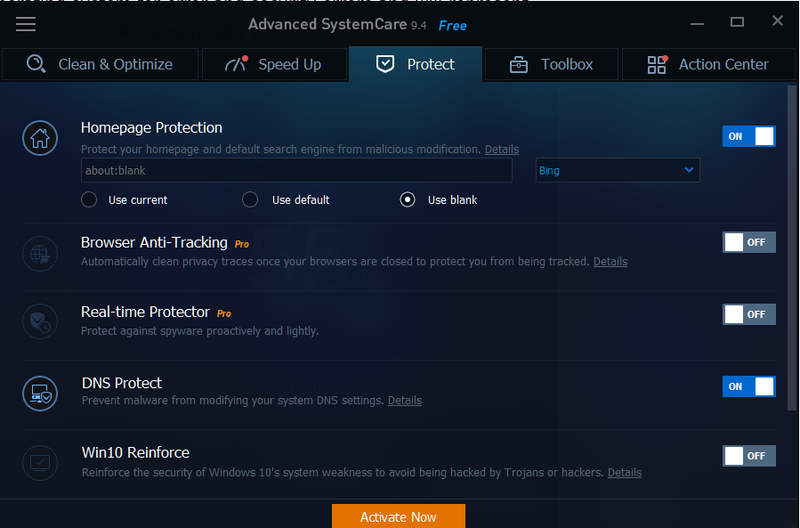 This also protects the DNS settings, enhance internet surfing, and reinforce the security of windows 10 to avoid being hacked by Trojans and hackers. Iobit Advance SystemCare is a user-friendly tool and capable of speed up your computer. 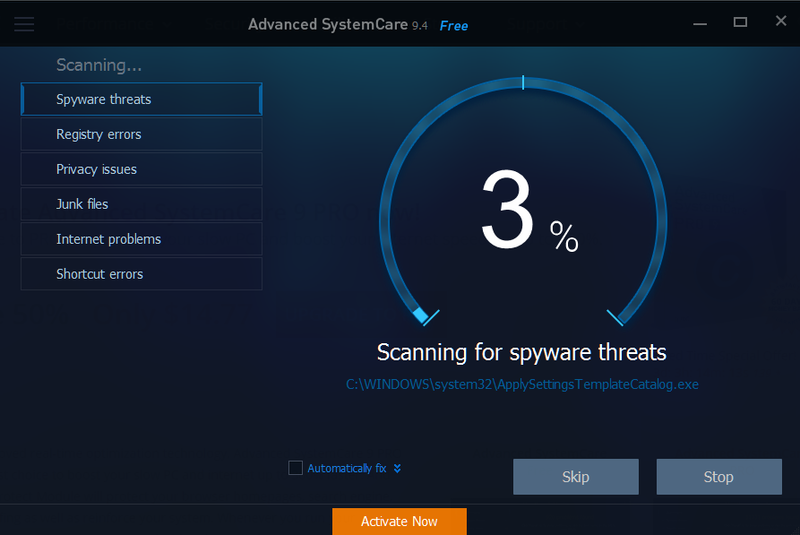 This freeware works with windows XP, windows 7, windows Vista, windows 8, and windows 10. 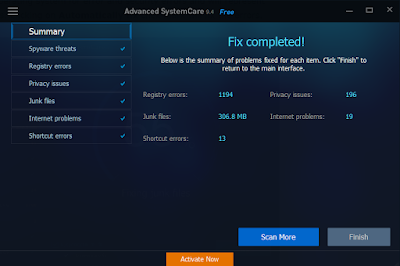 You can download Iobit Advance SystemCare from here.